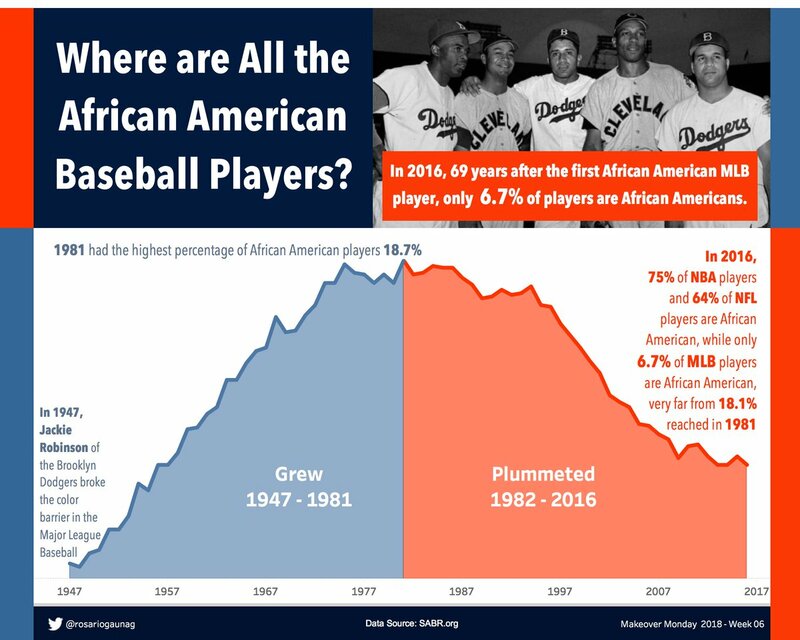 February is Black History Month and we challenged the Makeover Monday community to join the collaboration with Tableau and other data projects including Storytelling with Data, Viz for Social Good and Data for Democracy to visualize diversity. 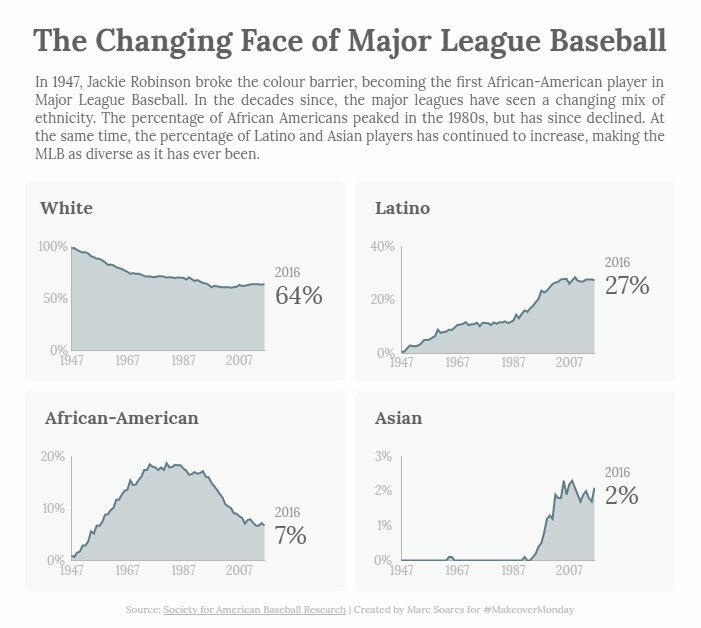 We kicked off the collaboration with a dataset about ethnic diversity and participation in Major League Baseball. 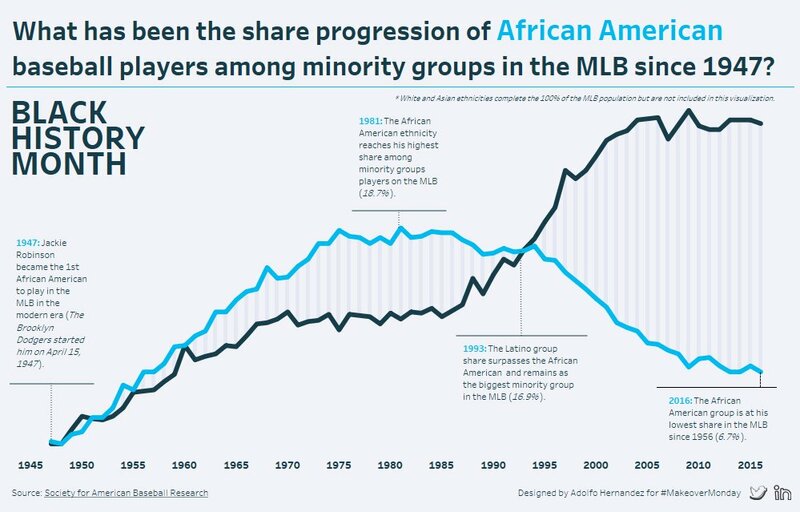 The dataset compared the percentage of players who were white versus African-American, Latino or Asian and also contained their value as players, measured by a contribution percentage. 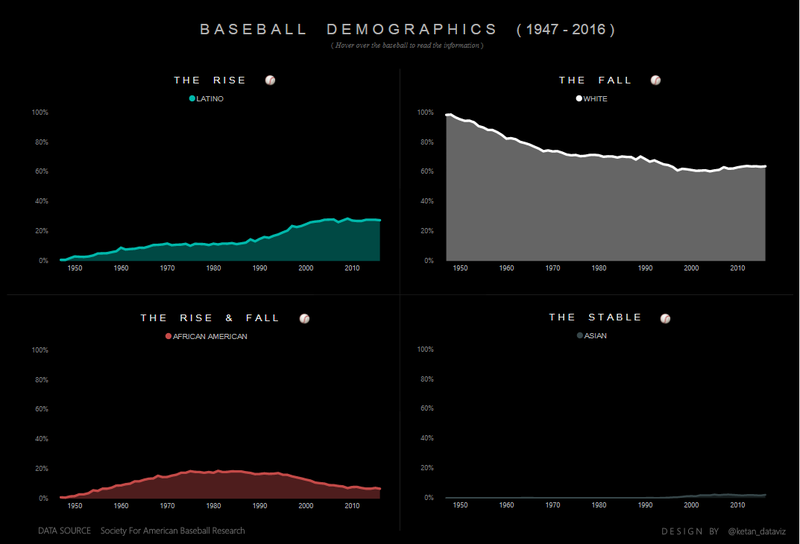 The Makeover Monday community contributed enthusiastically (as always) and built numerous great visualizations and data stories to bring this topic to life and make the data accessible for a wide audience. For this week’s lesson on design skills I want to highlight the value and importance of iterations and seeking feedback. Asking for input from others can help you improve your work because it not only gives you a second (and third or even fourth) opinion on what you created, it also teaches you to ask better and more precise questions (e.g. what specific parts of your design or analysis do you want feedback on? Are you unsure about the flow of the story or the colors you chose or the overall layout? ), helps you become a better communicator as you approach relative strangers to seek their input and challenges you to grow a ‘thicker skin’ as not all feedback may be as palatable or positive as you hope. And that’s okay because we all seek feedback to grow, not just to be smothered in compliments (of course compliments are great too!). For Makeover Monday each participant has the option to receive feedback on data.world in the discussion posts, during the weekly Viz Review webinar and on Twitter. The easiest way to receive feedback is by specifically asking for it and please don’t hesitate to seek feedback from the wider community as Andy and I only have limited time to get deeply involved (we’d love to spend much more time on giving individual feedback but there are over 200 of you most weeks and we simply can’t talk to everyone). Over the past 58 weeks since I joined the Makeover Monday Team of two, I have witnessed the improvement so many people (myself included) have made through this feedback loop, through being receptive to input from others and by implementing changes, iterating and republishing their work. 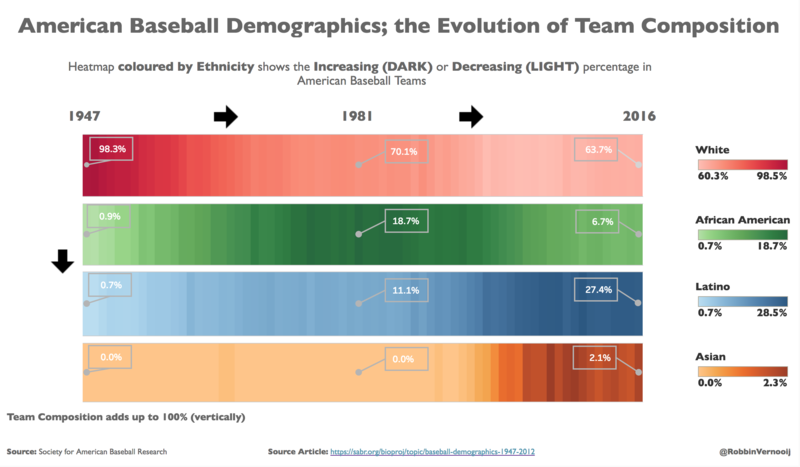 Having someone’s perspective and a fresh pair of eyes can help take your viz and data story to the next level so don’t ever be afraid to seek feedback. Here are a couple of examples of how you can go about it. Take Nish’s tweet which clearly states that he is seeking feedback. Nish is someone who works on his vizzes every week and makes changes after receiving feedback to publish an improved version. And have a look at the first submission by Adolfo compared to the final viz. 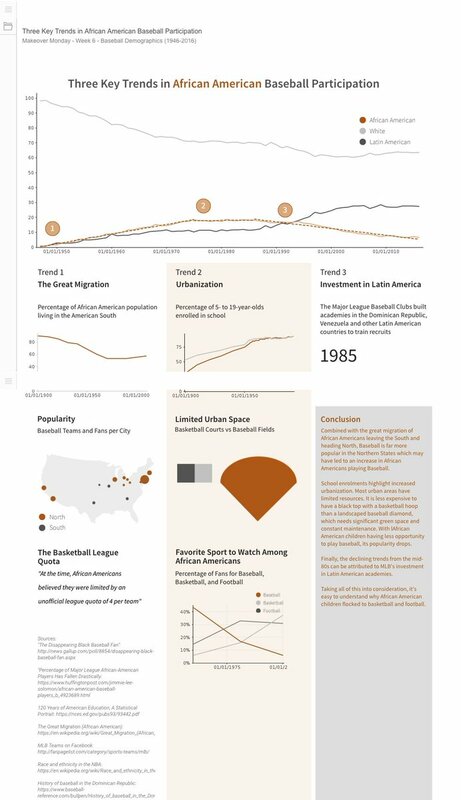 He made significant changes after Viz Review and if you ask me, the final dashboard looks a lot more polished, cleaner and easier to understand. 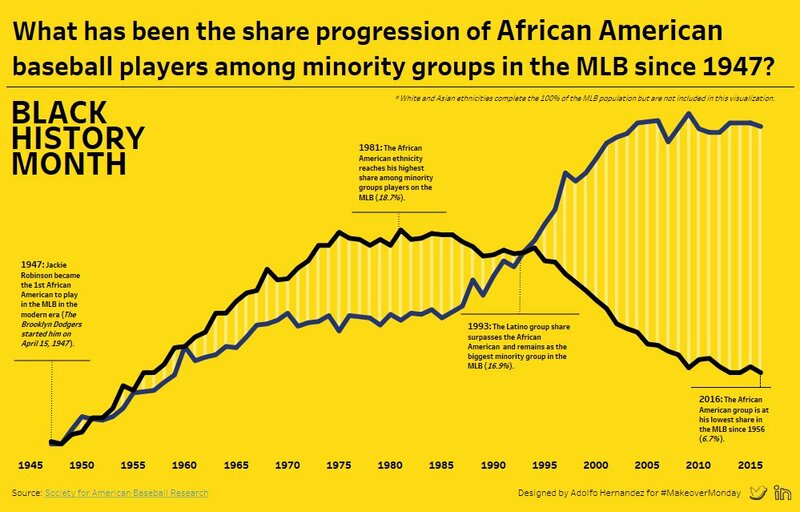 This week’s dataset contained percentages of players and in MLB, as Andy explained during Viz Review, each year there are (or can be) different numbers of players overall as well as in each team. We don’t know the total number of players so we can’t create weighted percentages. This week, some people took the annual percentage figures and averaged them over a decade to get decade by decade results. This is incorrect and we shouldn’t treat data this way as the results don’t represent the data accurately. 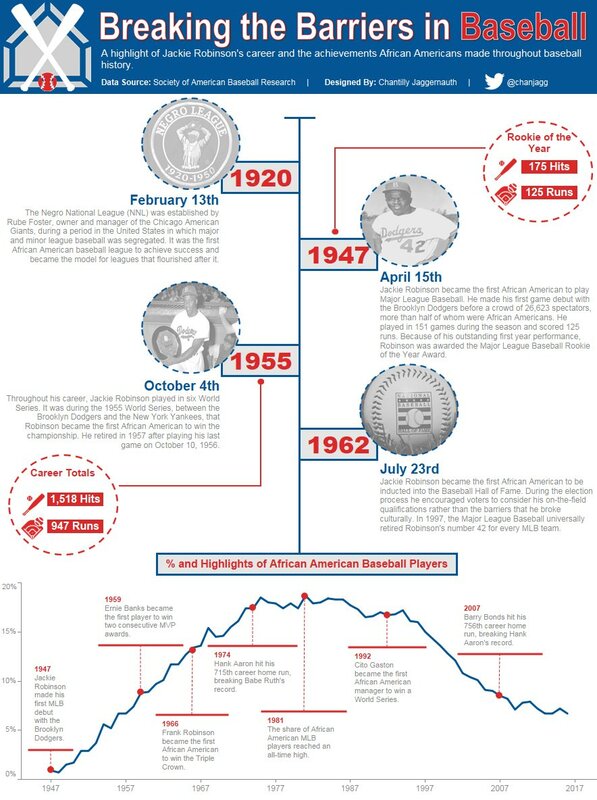 If you want to use additional data such as US census data which is published once per decade for example, then a better approach would be to take the percentage of players from the census year (rather than a decade average) and compare it to the census data for ethnicity percentages of that year. Before we look at this week’s favourites, I want to say a big and heartfelt THANK YOU to our whole community. Firstly, for participating in the #VisualizeDiversity challenge and secondly for embracing data.world and posting your submissions there. The discussion forum is a great place for seeking and providing feedback and for Andy and me data.world compared to Twitter is about 100x easier for reviewing the week’s submissions. The images are larger, less time needs to be spent clicking on things and more time can be devoted to actually looking at your work. We are in constant contact with the team at data.world to better understand their platform and ensure we get the best opportunities to communicate and collaborate with all of you. As discussion features grow and improve, we will have even better ways of exchanging ideas and commenting on your submissions.